The combined security forces of TNI/POLRI directly led by the chief of police AKBP Agung Marlianto and his deputy chief Alex Korwa fully armed with approximately 500 personnel attacked KNPB’s building. The Security forces also used about 100 Avanza cars as well as dozens of cars that all belong to American giant gold mine – Freeport. Indonesian security forces shot KNPB’s activists during the ride and others were captured by security forces. The following list shows the names of those who were captured by security forces. The KNPB Secretariat office and PRD Timika had been destroyed by both Indonesian military and police forces known as TNI and POLRI and confiscated all the goods belong to KNPB. Jack Yakonias Womsiwor was shot during this raid. The following is a list of items that had been confiscated by the security forces: 1. Cash of Rp. 15 million (equivalent to US$1, 300.00 2. Two mobile phones 3. KNPB’s activists’ T-shirts 4. One speaker 5. One laptop 6. Two computers (Desktop) 7. One printer 8. KNPB’s flags as well as many more items that have been taken by Indonesian security forces. The security forces did not only confiscate these items and goods, but they destroyed the office of KNPB-PRD that promotes West Papua independence. 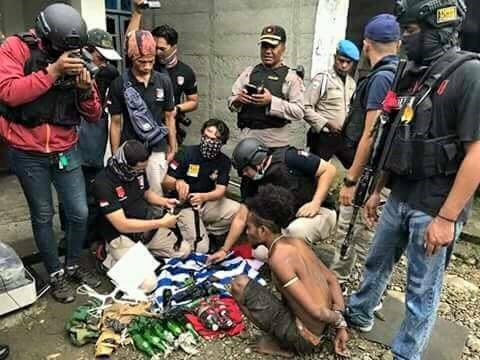 The police came in the early hours of the morning and surrounded the secretariat office of KNPB and National Parliament of West Papua in Timika and started arresting and shooting KNPB’s activists without showing any arrest warrants from the authority. They came in and shot, arrested, and destroyed everything without explaining the root cause of the problems.